Having trouble logging in or locating tickets ? There is a limitation with the QuickBooks SDK that it can connect only 1 company file at a time a user session. It means you cannot access multiple company files at the same time. 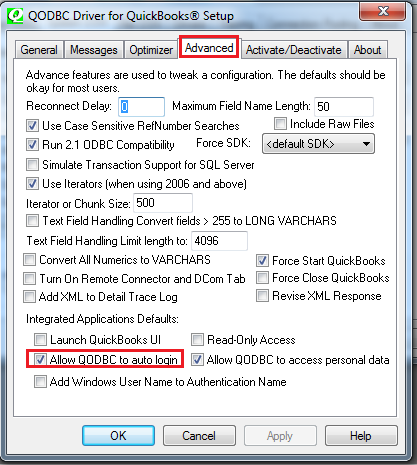 In this article, We will connect to two different company file using two different QODBC DSN which has auto login configured. We will be using two auto login DSN CompanyA & CompanyB in this example. Here is my DSN configuration for First Company file. You need to open QuickBooks & load company file which you have chosen in auto login DSN. 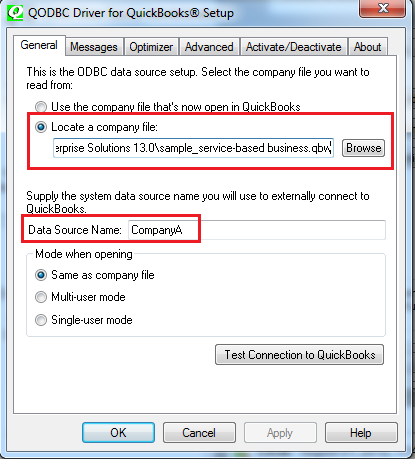 Company file path in QuickBooks & DSN should be matched. 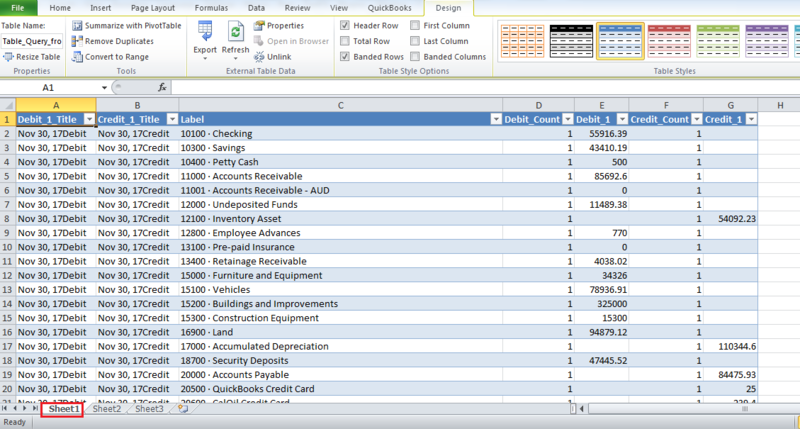 Open MS Excel & create a new spreadsheet. 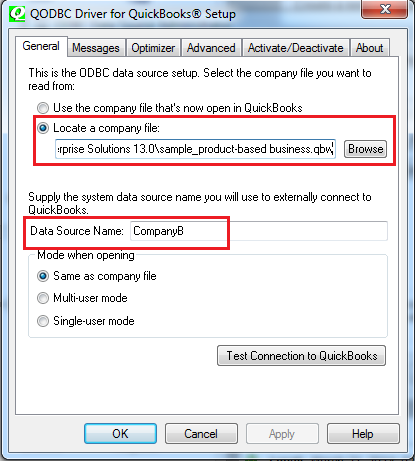 First, please select the "Data" tab, Navigate to "From Other Sources"->" From Microsoft Query"
The first time use MS Excel to access QuickBooks, you will be asked to grant access permission for QODBC. 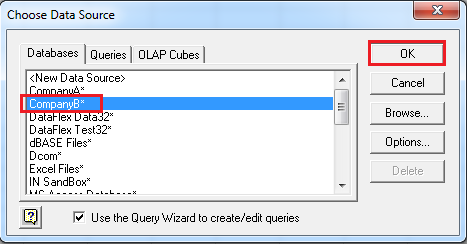 After you grant permission for QODBC, you will be guided by Query Wizard. 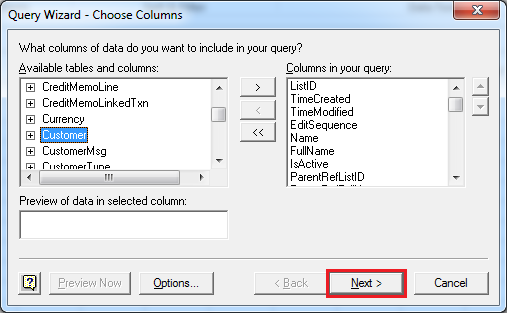 Choose any table click "Next" until you reach to Query Wizard. 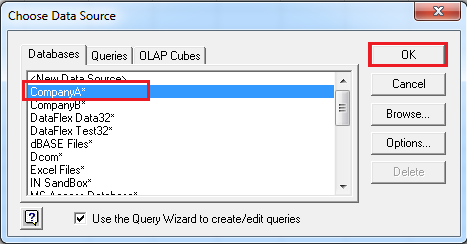 Write query & click OK. In this example, I am writing Trial Balance report query. 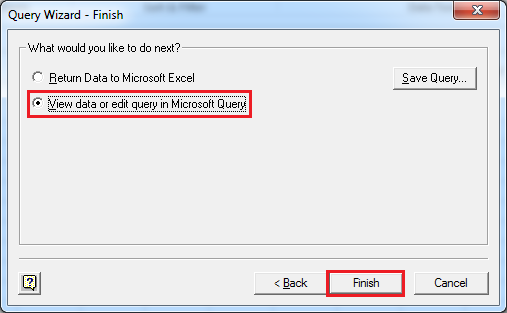 You will get below message box about SQL Query, Click OK.
Click on File & Return Data to Microsoft Excel to save the export report in Excel spreadsheet. 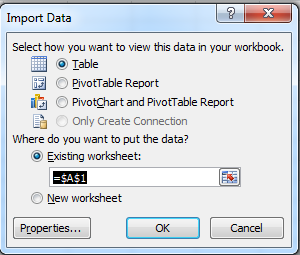 Report Data is exported to Excel sheet1. 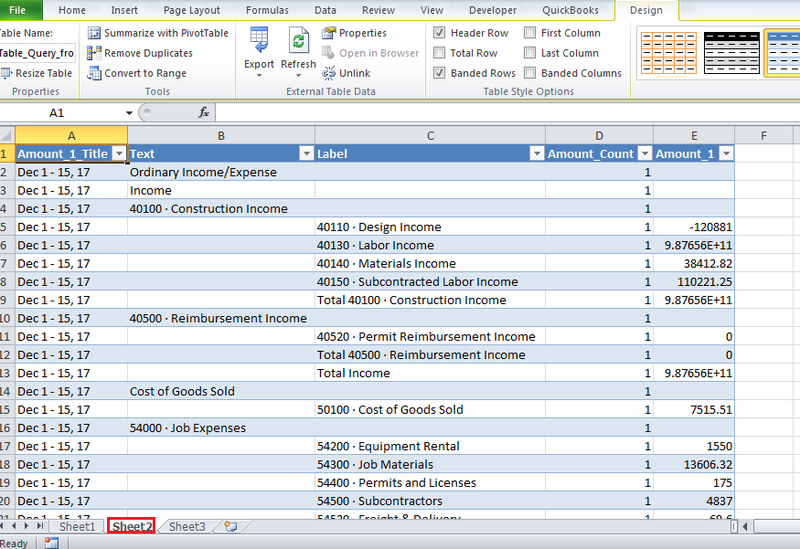 Now by repeating above steps, we will export another report in sheet2 using DSN CompanyB. We need to close first company file which is opened in QuickBooks. Here is my DSN configuration for Second Company file. Write query & click OK. In this example, I am writing Profit & Loss report query. Report Data is exported to Excel sheet2. 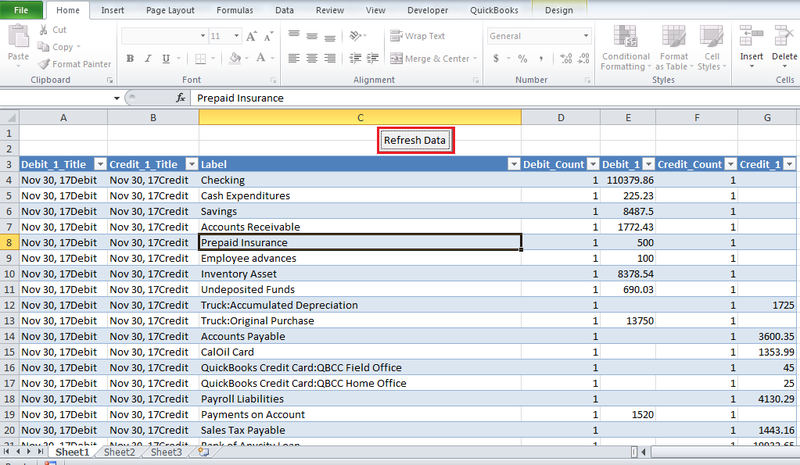 After the export is complete close company file which is opened in QuickBooks. 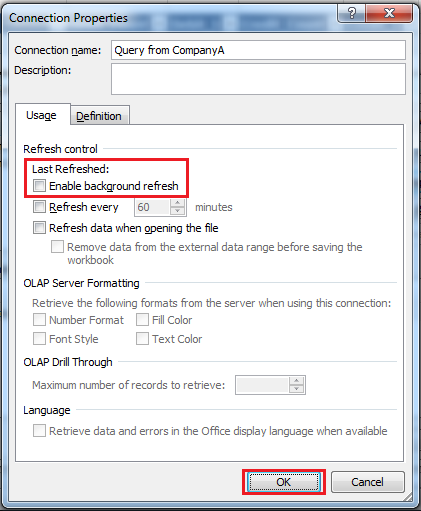 We need to disable auto-refresh of data for both company file connection (i.e. Query from CompanyA & Query from CompanyB ). Now we will add button & we will write code for button click event. On button click, it will open connection for CompanyA, refresh report data & close connection for CompanyA, sleep for 15 seconds, open connection for CompanyB, refresh report data & close connection for CompanyB. You can add button from Developer tab in MS Excel. If the Developer tab is not available, display it. Click the File tab, click Options, and then click the Customize Ribbon category. In the Main Tabs list, select the Developer check box, and then click OK.
On the Developer tab, in the Controls group, click Insert, and then under ActiveX Controls, click Command Button. Command Button is added. I have renamed it to Refresh Data. Double click on the command button to write code. Write below code to open connection for CompanyA, refresh report data & close connection for CompanyA, sleep for 15 seconds and open connection for CompanyB, refresh report data & close connection for CompanyB. 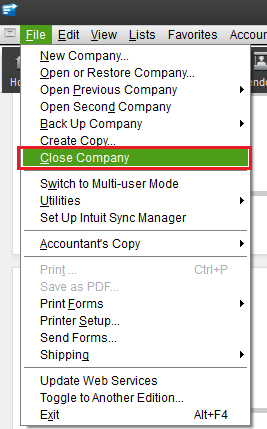 15 seconds sleep required for closing one company file and switch to another company file. Report Data will be refreshed on clicking Refresh Data button. Please complete the captcha below (we use this to prevent automated submissions).